We offer a wide variety of used heavy equipment including logging equipment, yarders, log loaders, processors, skidders, dozers and fire trucks. Construction equipment including hydraulic excavators, motor graders, wheel loaders, forklifts, skid steer loaders, water trucks, attachments and much more. 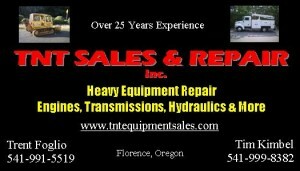 Log trucks, fifth wheel lowboy trucks and dump trucks. Lowboy trailers, log trailers, insert hay rack trailers, end dump pup trailers and utility trailers.